Soaring upwards on the wings of excellence is the motto for the Hydel Group of Schools and the ‘Talk Up Yout’ team got to experience how true those words are on Tuesday October 27th when the ‘Talk Up Yout’ school tour stopped by to give the students at Hydel a chance to talk up on their concerns and give their own solutions for many issues facing youth in Jamaica. The topics & Solutions discussed included peer pressure, Suicide, gender roles, abuse, slavery, self-confidence, politics and much more.. Here is a snippet of the 3 hour session! 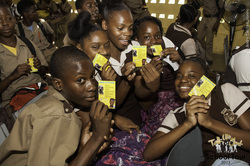 Kingston, 30 October 2015 – Talk Up Yout Executive Producer Emprezz Golding and CranWATA visited Ardenne High School and gave an inspirational address to more than 200 students from more than 5 different corporate area schools. Talk Up Yout is a household name in youth advocacy and development and the day’s session was designed to give young people the opportunity to decide which youth issues are most important to them and to develop their own solutions to these issues. The audience was comprised mainly of students from Ardenne High School and their Students Council Representatives as well as Students Council Representatives from Holy Childhood High School, The Queen’s School, St. Hugh’s High School for Girls, Immaculate Conception High, Excelsior High School. 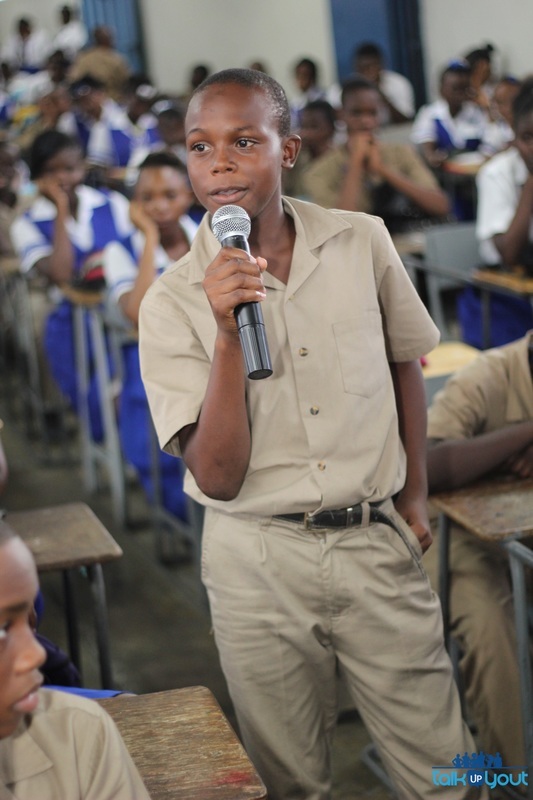 Student representatives from the various schools raised issues such as violence against children, teenage pregnancy, discrimination, a lack of knowledge of Jamaican history, youths not being able to talk to their parents and low self-esteem. The students’ solutions involved expanding education to include topics such as conflict resolution and thorough sexual education. Other solutions included embracing each other’s individuality and being supportive. Students urged their parents to become more involved in their lives and asked for more seminars like Talk Up Yout to teach them how to handle pressure and how to empower themselves. Jordan Anderson of Ardenne High School received resounding applause when he expressed his opinion that if youths knew more about how tactical and intelligent Jamaica’s National Heroes such as Nanny of the Maroons and Marcus Garvey were, they would be less likely to resort to violence to solve problems and they would think more highly of themselves. After giving the students the opportunity to express themselves, Emprezz addressed each of their issues and also provided them with additional solutions. She motivated them with chants about respecting their bodies, their minds and their country. She gave them information about how to choose role models, seek knowledge, work hard, find and create employment opportunities for themselves and design the kind of life they wanted to have. One student was so moved by Emprezz’ obvious passion for the youths that she requested an opportunity to speak to the audience. According to her youths bleach their skin and disrespect themselves because they are mentally enslaved. She asked her peers to be confident and to rise above negative influences. CranWATA Brand Ambassador and popular internet vlogger “Bella Blair” was also on hand to offer words of encouragement to the students. Bella is a former Holy Childhood student and CARIMAC graduate who has a passion for Arts. A “Jill of all trades” Bella is a comedic actress, singer, songwriter, editor, script writer among other things and urged the students to balance their time between following their passions and getting their education. She also inspired them with the story of her road to success and spoke eloquently about how important it is for young people to have good support systems to help them make good academic choices, health choices and life choices. At the end of the session refreshments and gift baskets for the student representatives were provided by CranWATA and WATA. The students also urged Emprezz to visit again. Quote of the DAY: “WEIRD is just a word to describe people who are Wise, Educated, Intelligent, Real and Determined.” – Ardenne Students: Jermaine Francis, Ashley-Gayle Lyons and Tamali Stewart. Written by Kristeena Monteith for Talk Up Yout!